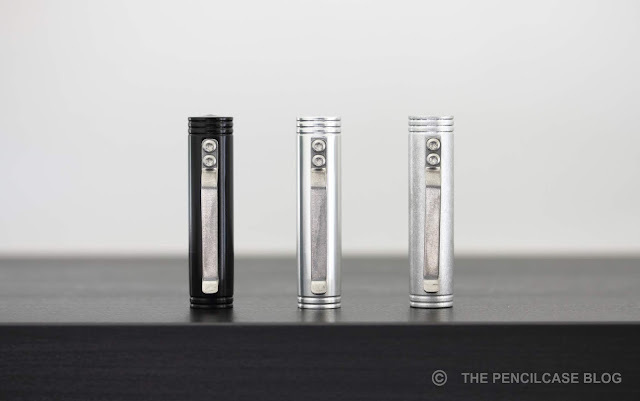 As you've most likely seen more and more reviews of the brand spanking new line of Karas Pen Co. products -The Reaktor (Stage 1) pens- pop up, I figured it was about high time to drop in my own 2 cents about them. I was lucky enough to get their entire product line sent over, and I think by now I've spent enough time with them to give you my final verdict. The Reaktor product line can be broken up into four products (for now, as there will likely be more products added later on): the Galaxie, Starliner, Galaxie XL and Starliner XL. I'll be doing things a bit differently than most other reviewers who discussed each pen separately. Instead, this post will be both a review and comparison of all four models, to show the differences and similarities between the various types. This might become a rather lengthy review... so let's get right to it! Karas Pen Co. (aka. 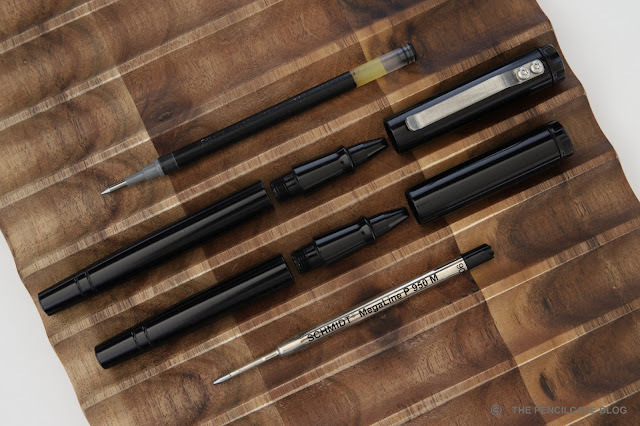 Karas Kustoms) has had quite an impressive track record so far, with some hugely popular pens like the Render K, Retrakt (reviewed HERE) or Ink. But looking at their latest releases, they are clearly taking a new direction to diversify their offerings. They used to focus primarily on the EDC community, with big, heavy and tough machined metal pens. Since last year they threw in the new Signature line of pens, with the fantastic Decograph (that I reviewed HERE) and now the Vertex (which premiered at the DC pen show last weekend). 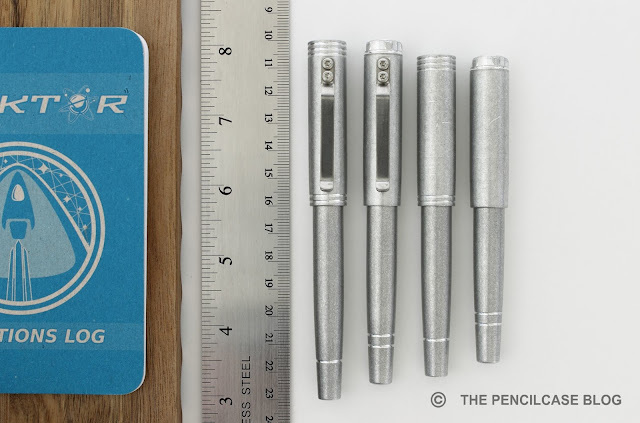 A third line was launched last week with the Reaktor and its first two products: the Galaxie XL and Starliner XL (the regular Galaxie and Starliner pens will be released later this month). With stage 1 of the Reaktor pens, they are filling a gap in the lower-end product lineup, providing a cheaper alternative that retains the 'made in the USA' quality. Sort of a gateway drug into the hobby. As I mentioned earlier, the first stage of the Reaktor product line includes four different pens available in four colorways, making for a total of 16 different configurations. Interestingly, the fountain pens (Starliner) and rollerball/ballpoint pens (Galaxie) each have their own design style, although they follow the same general form factor for the most part. Karas relies heavily on vintage 'Americana' influences for the Reaktor series. Both the Galaxie and Starliner found their inspiration in the space race and automotive industry (both pens being named after Ford cars), which reflects in certain prominent design features, as well as more subtle details. The Galaxie and Galaxie XL are immediately recogniseable by its intricately CNC'd cap finial, which represents hose fixtures found on space suits (take a look at this space suit from Buzz Aldrin, and you'll also see where they got the inspiration for the anodizing colors, not coincidentally also the colors of the US flag!). The Starliner and Starliner XL have a more subtle, but stately flat-top design. The cap and barrel finials have a subtle point machined in them, which bounces off the light to mimic the glint of a star (I think it kind of looks like the gravitational field of a star... I'm a geek, lol). 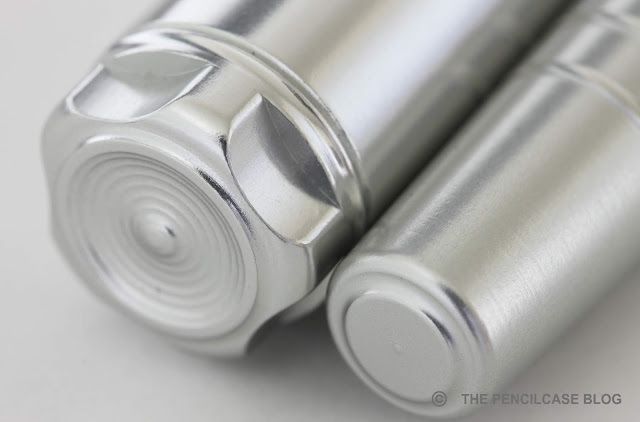 The Starliner also includes a cool reference within the rings engraved all over the pen: 3 on the cap finial, 2 at the base of the cap and 1 at the back of the barrel. 3...2...2 LIFTOFF! The overall shape of the pens is the same for both models: flattop with an oversized cap and narrower, strongly tapered barrel. 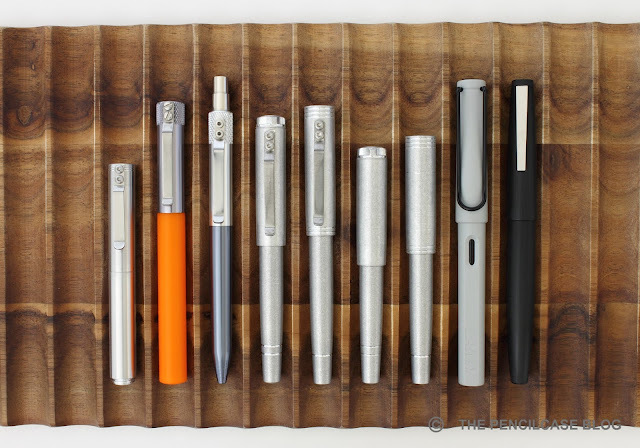 The proportions are admittedly a bit quirky and unusual, which makes these pens immediately recognizable. Then there's the two sizes that you can choose from: regular or XL. Apart from the obvious difference in size, the XL also differs because of the sprung steel clip. The smaller size is made to carry inside your pocket, while the XL can be attached to your pocket. Both pens are actually fairly compact. 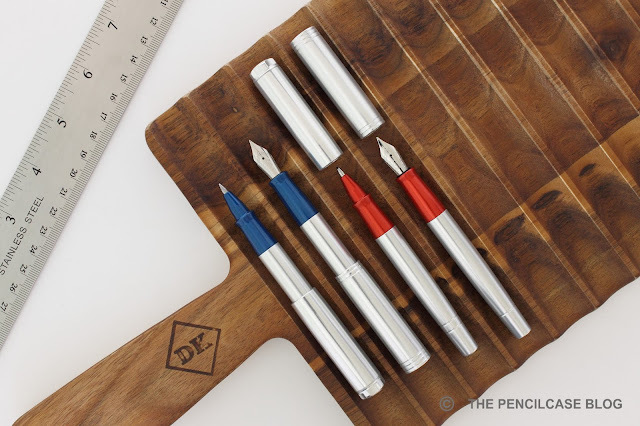 But the smaller model is a 'true' pocket pen that is extremely comfortable to just throw in your pocket and always have with you, whereas the XL is a more full-sized pen. 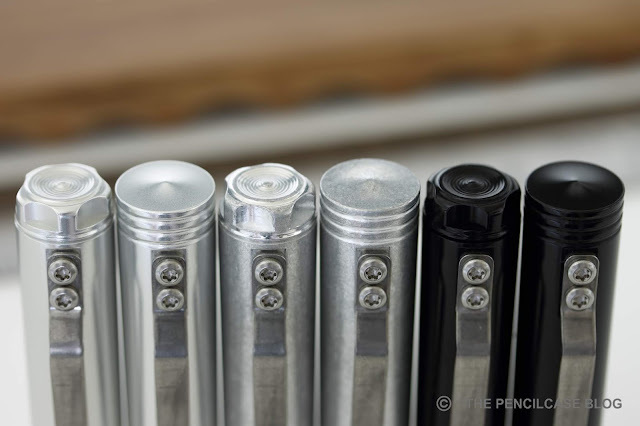 The Galaxie and Starliner are the first Karas pens that feature a snap cap. The mechanism is simple: a rubber o-ring inside the cap provides a 'bump' on which the flared edge of the section catches. Even though it's a somewhat unconventional mechanism, it works surprisingly well. The cap opens and closes with a reassuring 'snap' and I never worried that the cap may pop off inside my pants pocket. Worth pointing out is that the closure mechanism does allow for some side-to-side wiggle. The cap rattles a tiny bit, although I expected much worse. 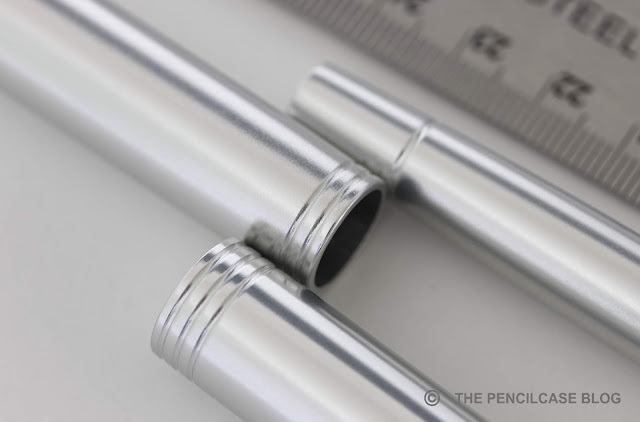 Because these pens sit at an entry-level price point, the material and finish options are restricted to aluminium in either silver or black anodized finish, or a tumbled finish. The silver annodised version is available with a blue or red anodized grip section to give a total of four colorways to choose from. I'm personally a big fan of the tumbled and black anodized finishes. The reasoning behind this narrowed down offering is simply to cut on production costs. 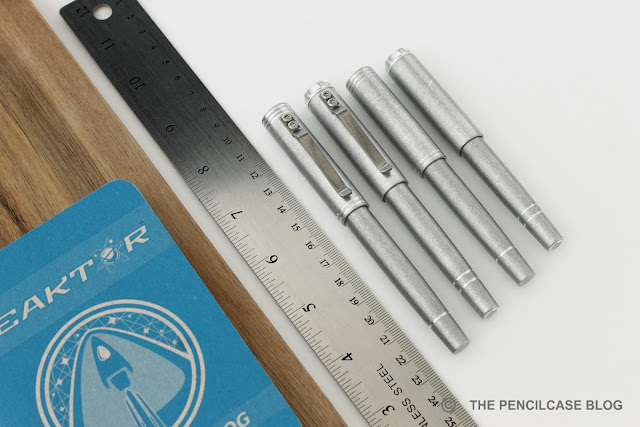 The Galaxie ballpoint pen and Starliner fountain pen are pocket-sized pens, and measure 11cm (4.3") and 11.5cm (4.5") respectively when closed. 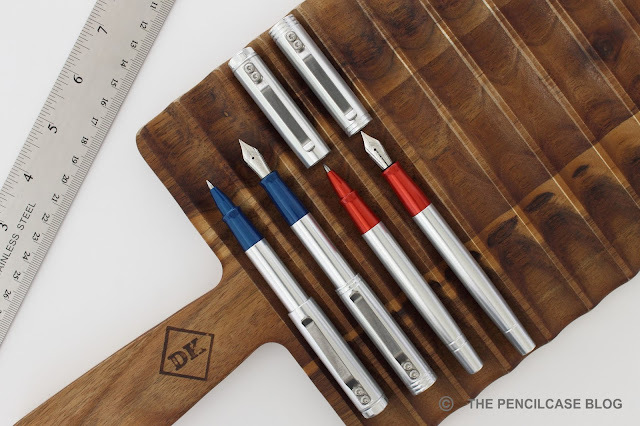 Uncapped, both pens drop below 11cm, which is too short for anything but a quick jot. The cap posts securely with a firm push, and the o-ring inside the cap holds it in place. The cap posts deeply onto the barrel, making for a total length of 11.5cm (4.5") for the Galaxie and 12.5cm (4.9") for the Starliner. Both pens weigh in at 24g total, which is not particularly heavy, but enough to give a solid feel in the hand. The larger Galaxie XL rollerball and Starliner XL fountain pen receive a modest bump in length: 12.3cm and 12.8cm respectively. Uncapped, the Galaxie XL rollerball is a bit short for me, measuring 11.6cm (4.56"), but the Starliner XL fountain pen has a slightly longer section which brings up to a more comfortable length of 12.5cm (4.9"). 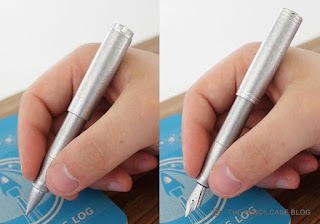 Posted, both pens have a comfortable length (12.9cm/5.1" for the Galaxie XL and 13.7cm/5.4" for the Starliner XL), and the oversized cap gives it a more central-weighted feel in the hand. The clip and slightly larger dimensions increase the total weight to 29g, which is still relatively lightweight. 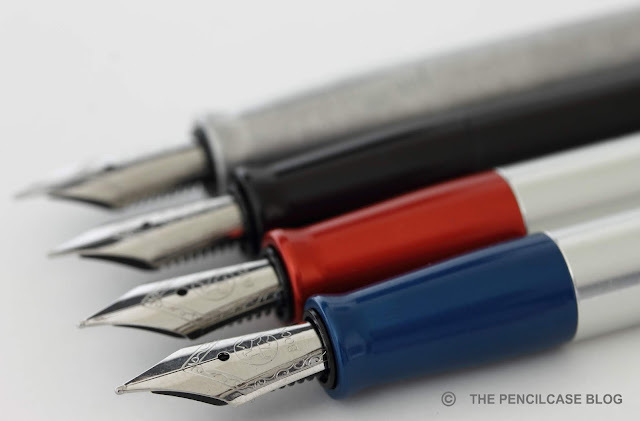 All four pens have a similar section shape, but the Starliner fountain pens have the advantage of a slightly longer section. 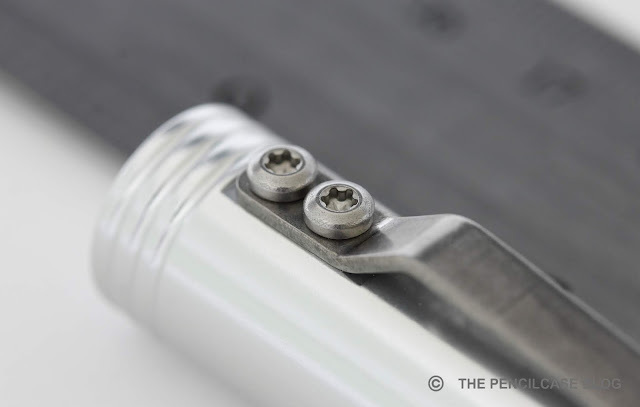 The widest part of the section measures 1.1cm (0.43"), and tapers down strongly towards the nib, where it flares out again to provide a secure grip. The section design, combined with the lack of threads and a smooth transition from barrel to section, makes the Galaxie and Starliner pens all extremely comfortable and balanced writers. Granted, the regular Galaxie and Starliner HAVE to be posted to comfortably fit my hand, whereas the XL's are comfortable either way. New for Karas pens are the Bock 076 nibs used on the Starliner fountain pens. Up until a month or two ago, I had only seen this nib size on the TWSBI 580. And now in a relatively short time, both the Stilform Kosmos Ink (reviewed HERE) and these Starliners make use of them. 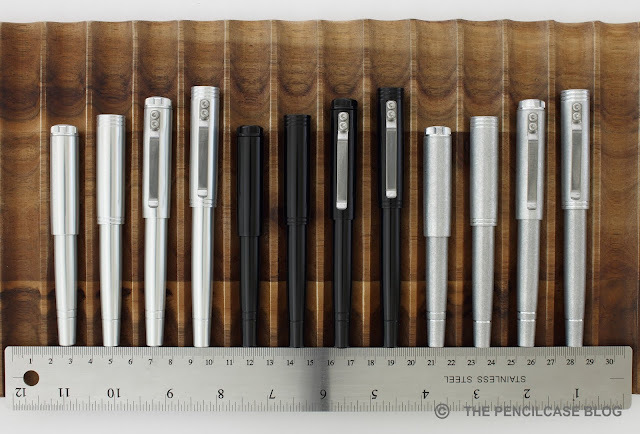 In size, the 076 sits in between the #5 and #6, but shares the housing with the #5 nibs so these are interchangeable. In terms of performance, I'd also rate them in between the #5 and #6. I'm not a huge fan of the small #5 because I find the ink flow can sometimes be a bit unpredictable. The nibs on the Starliner are smooth and responsive, all the way from EF to B. The ink flow seems better and more consistent than on the #5's. I really enjoyed using these pens for EDC, and never had issues with any of them (the rubber o-ring also does a pretty good job keeping the nib from drying out). Bock nibs are often criticized for being lackluster, but they get the job done just fine. The Galaxie and Galaxie XL use different refills. Where the Galaxie is meant as a ballpoint, and utilizes the Parker-style G2 refills, the XL can accomodate the larger Pilot G2 rollerball refills. The Galaxie comes loaded with a Schmidt Megaline P950 medium refill in black. This pressurized refill works well and lays down a line that is relatively dark and consistent. I personally prefer the Schmidt Easyflow 9000 which are smoother and darker (although more prone to smearing). But of course you can swap the refill out for whatever suits you best. The Galaxie XL comes with a 0.5mm Pilot G2 refill in black, which is an excellent refill for my taste. It works consistently in my hands , and lays down a crisp line that suits my needs just fine (some prefer the finer 0.38mm tip size). Karas wanted to fill a gap in the low end of their catalog. And if you ask me, they did a great job filling the vacancy with this new Reaktor line. The Reaktor pens start at 40$ for the Galaxie, and go up from there (45$ for the Galaxie XL, 50$ for the Starliner and 55$ for the Starliner XL), which even includes domestic shipping! These pens offer incredible value for money at a price point previously unseen on the market of USA-made metal pens. Does that mean they had to chimp on quality? I don't think so. They managed to cut costs by implementing some clever tricks: a smaller nib, only one material and four finishes (specifically those finishes that are easiest to manufacture consistently, to minimize losses through faulty parts). You also won't find the regular packaging here, but instead the pens will come in color-coded pen tubes, which are cheaper and easier to ship because they are smaller. Along with the recent Signature line, the new Reaktor pens prove that the people at Karas Pen Co. are working hard to bring products to the market that diversify their offerings, which will appeal to a wider audience. In this case, the Galaxie and Starliner are fantastic options for people that are just starting out in the hobby, or if you are looking for a cheap but durable EDC option. This product was sent to me by Karas Pen Co. so I could write this review. I was in no way influenced in the making of this review, the opinions shared in this review are completely my own! This post does not contain affilate links.